I love combing fibre as a way to prepare it for spinning. Several of my blog posts can attest to that. However, the one thing that really bothers me about combing is the waste. Last weekend I prepared some fibre for an upcoming workshop I am teaching. I made a series of lovely combed nests. 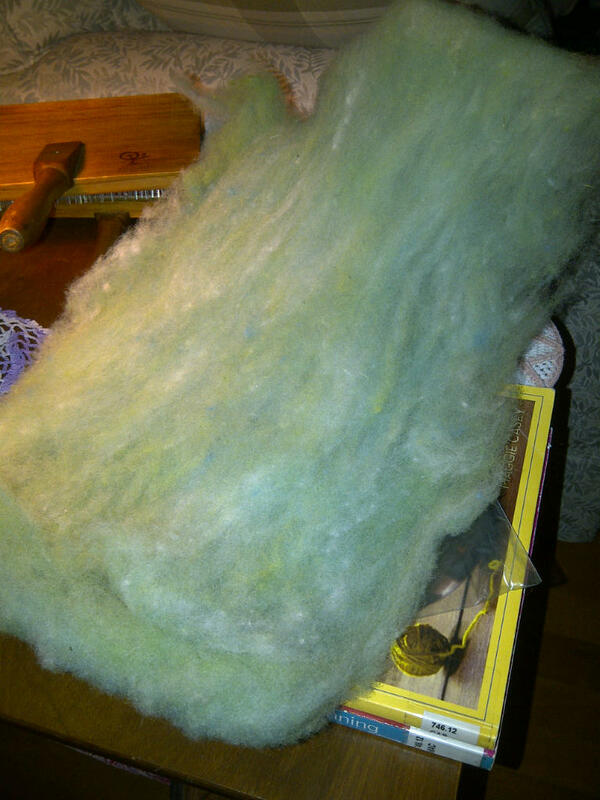 After 70 grams worth of combed fibres, I weighed the waste that was left on the combs. 31.5 grams!!! So — of an approximate total of 100 grams of fibre, I can get 70 grams of finished ready-to-spin stuff and approximately 30 grams of stuff I have to find something to do with. I usually stuff the waste into the bottom of a sock I find in the laundry. 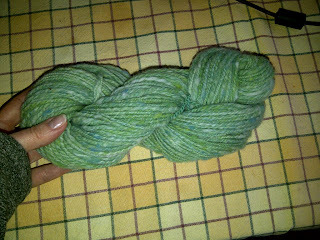 It goes through a wash and dry cycle and out pops a lovely felted ball. These balls make great kitchen hockey balls, kitty play-thing balls, and base balls on which to wind spun singles. However, there are only so many one needs in one’s life. I knew that some people card this stuff up and use it in their spinning. It just seemed so uninspiring — all those short bits, random second cuts, fibres of multiple lengths. But what’s the harm in an experiment? I took the bags of waste I had collected from the combing — one series was dyed Dorset (green/blue) the other bag was undyed, beautiful white Montadale. 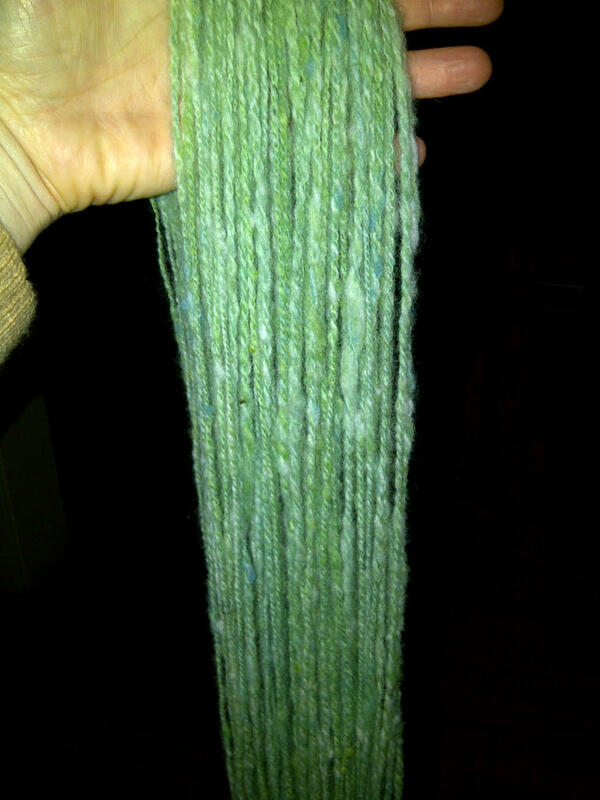 I put them through my drum carder three times, blending the colours and creating two decent sized batts. 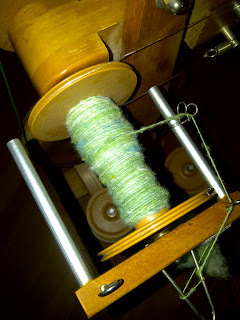 I’ve been brushing up on my spinning techniques in preparation for some workshops I’ve proposed for Fibreswest. 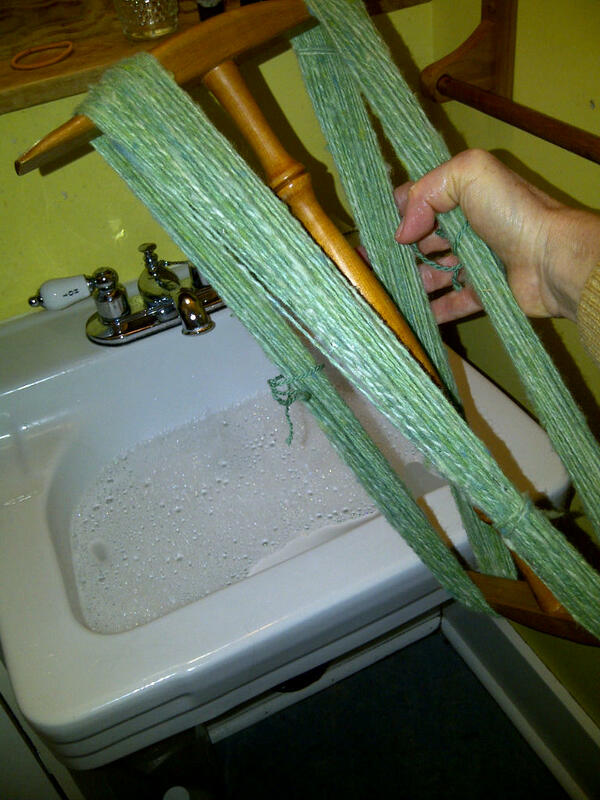 This batt of fibre was an excellent candidate for the woolen spinning technique. Woolen spinning — is where you allow the twist to enter into the fibres and while it is doing that, you slowly and intentionally pull away. When you have as much twist as you want — and for a lofty yarn you just want the fibres locked — then you let the whole piece run onto the bobbin. 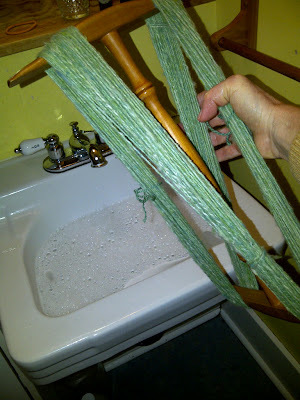 And then you start again letting the twist enter the fibre source and pulling back. For those of us who are more familiar with the worsted technique, where you never allow the twist to enter the fibre source — you feed the fibre to the twist — the woolen technique takes some getting used to. It also takes some getting used to because it doesn’t look all that great on the bobbin. There are bumps and funny bits that you are tempted to remove. But don’t. That’s all part of the package. 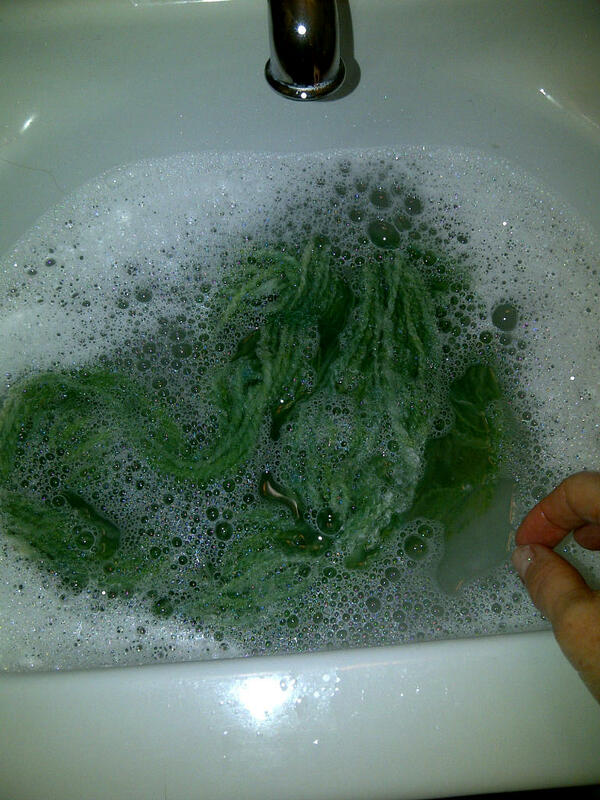 Apart from the spinning technique, the real magic with woolen spun yarn happens when you wash it. 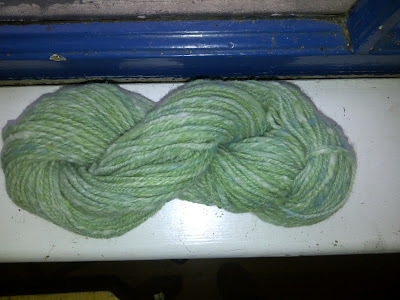 Here’s a photo essay of my yarn, from bobbin to finished skein. 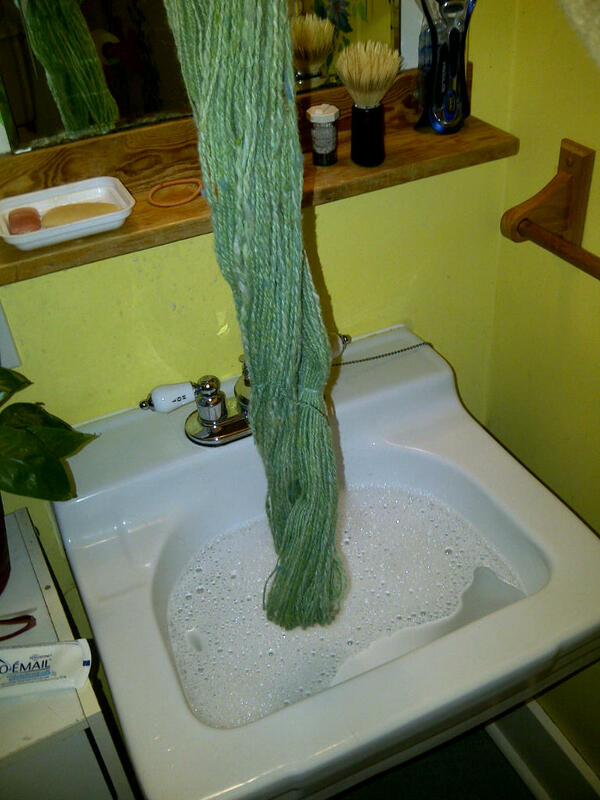 You can almost hear the yarn moan as it expands, relaxes, and blooms. I let it soak for few minutes in very warm soapy water and beat it up a bit while it was in the water. I squeezed it and roughed it up. And then I did something that I have read about, but never had the nerve to do with yarn. Right after this warm soapy bath, I squeezed the water out and then filled the sink with ice cold water and threw it in. While in there I continued the beating. The point of this is to try to slightly felt the yarn. Not so much that it loses it’s elasticity, but enough that it will hold together and those shorter bits won’t quickly find their way out of your stitches. ie. pill. So here is the lovely skein — my experiment with wool-stuff that would either be a felted ball or just thrown into the garbage. It is 46g and 82m. I couldn’t believe how light it was, especially after it dried. I can’t knit anything up with it yet because I want to use this skein as a sample — if my class runs. I’ll just have to make another one. This entry was posted in dorset, handspun yarn, local fibre, Montadale, spinning, wool, wool combs, woolen yarn on January 28, 2012 by DianaTwiss.